An old-fashioned Irish pub in New Cross. In an area which has only slowly been affected by the creep of gentrification, there are still a fair few places with claims to be unreconstructed, traditional boozers, especially down this end (towards Deptford Broadway). 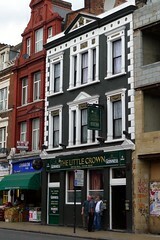 The Little Crown is very much one of these, down to its charming peeling paintwork, and faded Guinness signs. Inside, there are tables around two walls of the pub, a television playing the music channel (though if you put money into the jukebox, the TV sound fades out), and glum-looking barflys propped along the bar. The atmosphere is not in any way threatening, in fact there's a little friendly banter at the next table. You can easily sit here in silence drinking alone, as one young chap was doing on our visit. There's also a dartboard. There are no ales on tap, just John Smith's, Guinness and the usual lagers. Nothing unfriendly here, quite nice in its own way. Last visited by Ewan, Bec and Sean, 27 March 2008. Last edited 2011-05-30 20:44:04 (version 6; diff). List all versions. Page last edited 2011-05-30 20:44:04 (version 6).